This mutant resembling a giant beetle settled on the edge of Forest of Claws. 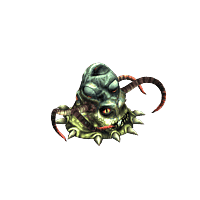 It is one of the minions of Lady Sorcha, but its actions are driven mainly by an everlasting hunger. 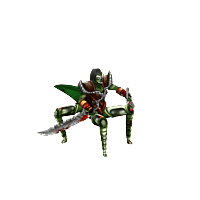 Thick chitin armor protects it from most of attacks, and strong mandibles can behead a victim in a single snap. 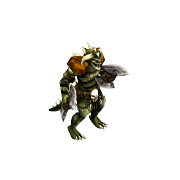 Fire-breathing large horned lizard is one of the most foul mutants serving the Legion. It can see even in total darkness so it wanders about the catacombs without trouble, depriving the dead of their rest, and the living of their lives. Leader of the Legion's forces in Forest of Claws. Soldiers of the Alliance call her Mother-General. They believe all mutants they fight with are her children. Only a few survived a duel with Lady Sorcha. And those who did, never fully recovered. Torwal is one o such persons. Lady Sorcha is a cruel creature finding pleasure in causing pain. They say that her saw-toothed blades are a cursed weapon. A pile of battered bones is kept together only by some dark magic. Mere appearance of this creature causes fear, but it is its wailing that elicits true terror, even in the bravest of hearts. Only a few soldiers have even seen this beast inhabiting a cave under the sands of Shinara Desert... but perhaps it's better this way. The most dangerous of all Stevenson's war machines. It is an armored construct equipped with powerful arms and a flame-thrower. It is able to decide the outcome of a battle singlehandedly. The silver lining of this cloud is the fact that in order to build such a monster, many rare parts are required. This is the only cause Stevenson has not already overrun whole Tamrel with copies of this beast. 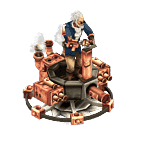 A mad scientist of the Steamers, who allied with the Legion as a protest. This exceptional mind resides in a frail body which is not even able to move unaided. His constructs, albeit extremely dangerous, are undisputed technical marvels. Striving for perfection, Stevenson went so far as to experiment on his own body. This creature – half plant, half animal – was bred by Gorgon in a small cave in the swamp. It has been discovered only recently, so no one knows what is it capable of. A jelly creature with numerous eyes, the most loyal servant of Gorgon. Seen by the few, the Beholder sees all what is occurring in Cursed Land. No one was able to hide from it. Ruins of Fenran village, once populous and teeming, are a dismal proof of this fact. Once, he was a revered Fangs Shaman and member of Druid Congregation, hiding his fervent affection to Echoes Priestess Ayra from the public. Today, he is the leader of the Legion. 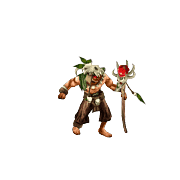 As befits a Fangs, he is of powerful build, but his true strength consist in his spirit and bonds with nature. Nobody knows how he gathered such a vast army of monstrous beasts, nor what his true intentions are... Nevertheless, he must be stopped!